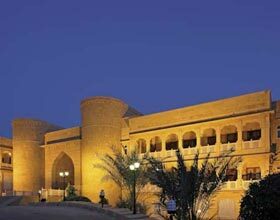 Address: Village Khuri,Jaisalmer, Khoohdi, Rajasthan 345001 India. 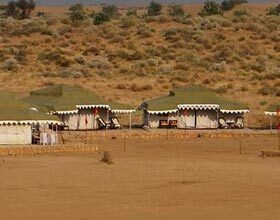 A mesmerizing experience of abode of the ancient Rajput era in the camps by the maharajas during their journey, The Mama's Resort & Camp Jaisalmer is cradled on the sand dunes about 45 kms away from bustling city. Providing a choice of Luxury Camp or Cottage, all accommodations open into a private patio, equipped with independent generators, and have hot and cold water availability. Unwind the charismatic folk tales of the seductive Thar Desert or relish the exquisite performances in night by local folk artists during the bonfire. The beautiful d�cor around the khemas or the tents and all along the alleys including small fountains adds charm to this splendid resort. The dull colored exteriors of the luxurious tented accommodations nestle aptly with the surrounding golden dunes of the Khuri region. Experience the monotonous hues fades away as you are welcomed by vibrantly designed interiors of these sumptuous guest tents at The Mama's Resort & Camp Jaisalmer. Attached spacious bath, modern amenities and king size furniture are among few additional amenities adding magnificence to the lodging in this nomadic styled resort. A lavish treat amidst the wilderness of the sand dunes in Khuri, eatery at Mama's Resort and Camp Jaisalmer serves savor from all parts of the world. The alfresco venue on the pristine golden sands offering independent tented sit-outs around the restaurant kitchen recreates the tranquil ambience during starlit nights. Adore the delicious barbeque appetizers served during the bonfire.